Surprisingly, we have a fair bit of wine still hanging around in our basement from our very first California wine country trip 3 years ago. This surprises me since it made a move with us, and it especially surprised me since we tend to drink our white wines fairly quickly. But this one somehow slipped through until just the other day. 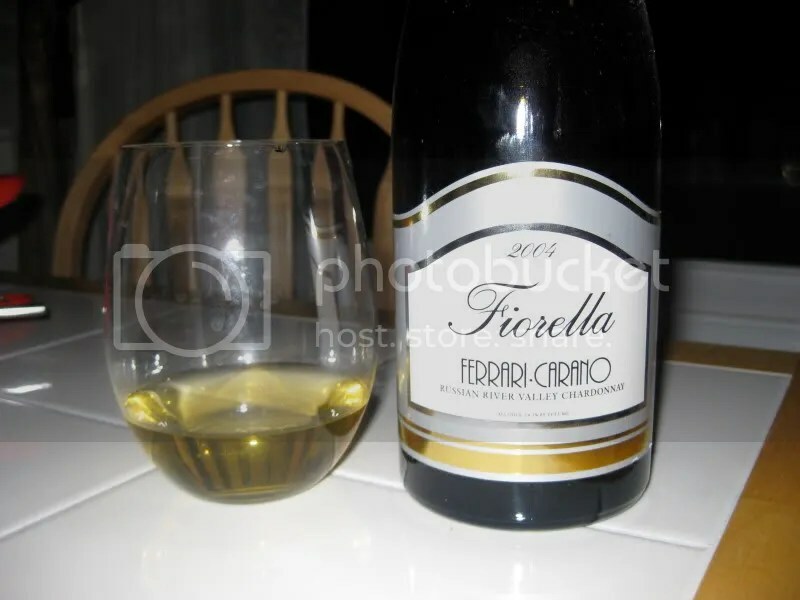 I plucked the 2004 Ferrari Carano Fiorella Chardonnay from its resting place in a styrofoam shipper. We purchased this at the winery in 2006 for $29, it had a real cork closure, and clocked in at 14.1% alcohol by volume. On the nose I found lemon, spice, yellow apple, coconut, cream, pear, cinnamon, and baking spice. The spices…cinnamon and baking space surprised me, I can’t say I’ve found that on a Chardonnay before. I also liked that while the nose showed some cream, I didn’t find any butter or oak. In the mouth I got apple, pear, lemon on the edges, something tropical, perhaps pineapple, stone fruit, and some butterscotch rounding out the mouth. Overall, this has held up amazingly well. This got shipped cross-country, lived in the bedroom of our apartment for a year, moved with us, and has now spent two years in our basement and it did not show a single ill-effect from that treatment. I found the wine to be full with some nice tartness left on the fruit. The fruit still tasted fresh! I really enjoyed this wine. The wine of the evening was a 2005 Ferrari Carano Fior di Moscato. I honestly have no idea what this wine cost as it is only available in the tasting room. I’m certain we bought it last August while visiting, but that receipt never made it home with us. The wine had a real cork closure, was 13.5% alcohol by volume and is a Muscat Canelli. This a very sweet wine. You can smell the sweetness on the nose. The aromas are floral, apricots, honey, and an orange essence. In the mouth, again, the wine is very sweet. The prevailing flavors are honey and apricots. There’s also something slightly tangy on the back of the palate. I served this wine with bourbon chicken and macaroni and cheese. It was an awful match. Really bad, the sweetness of the wine overwhelmed the food. It was much better as a sipping wine after dinner. However, I could imagine that it would be excellent with a sharp or blue cheese. What was wrong with my wine? So the Sauvignon Blanc from Steenberg was not the only bottle we tried to drink the other night. I also opened a bottle of 2005 Ferrari-Carano Sauvignon Blanc. This one came in a club shipment this fall. It was $15.60, had a cork closure and was 14.2% alcohol by volume. I am absolutely convinced we had a bad bottle. The notes on the bottle read: Clean, crisp and vibrant, this wine was made from a unique grape clone of the Sauvignon Blanc family called Sauvignon Musque. 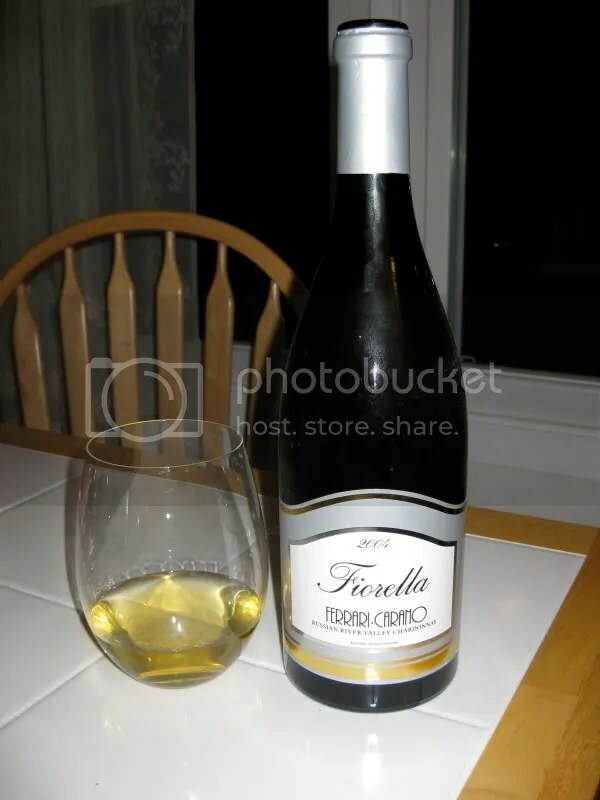 Nicely balanced, this wine displays an intense floral aroma with hints of citrus and fruit flavors. Bone dry with lively acidity, this very limited special wine underwent extremely cold fermentation to retain its varietal characteristics. Perfect with delicate dishes or as an apertif. I will give it this much: it certainly had an intense aroma. Such an intense aroma that I kind of wanted to gag. It was a muskily sweet aroma. I would call it rotten oranges or peaches with a little applesauce thrown in. I have to admit it was hard to get it past my nose to actually taste the wine. Matt only made it through one sip before declaring it undrinkable. I got about halfway through my glass before I too had to admit defeat. In the mouth it was flat. It really tasted like slightly sweet juice, but of no distinct flavor. The color was also off. Matt poured it down the drain before I could take a picture, but the wine was a very dark yellow color in the bottle and glass. It was eventually the aroma that did me in, it was so hard to get past it. Not to mention the flat and lifeless taste in the mouth. Served this little beauty last night to our dinner guests with the appetizer and main course. Bruschetta and homemade pizza. Which were both excellent if I do say so myself! The wine was a decent match with the dinner, but might have done better with a light meat dish. A very nice wine though, and it could easily have been enjoyed alone, which I did with the last little bit after our guests left. Blackberries, black cherries, a bit of spice. Just a touch of oak. I decanted the bottle for about an hour before serving it, and I think it really helped. The wine was flavorful, well balanced and perfect to drink now. Go, drink it if you have it! This cost us $24 minus a club discount and we picked it up while we were at Ferrari. Ferrari Carano was a beautiful place to visit. Go to it for the grounds alone (picture above was taken in August). 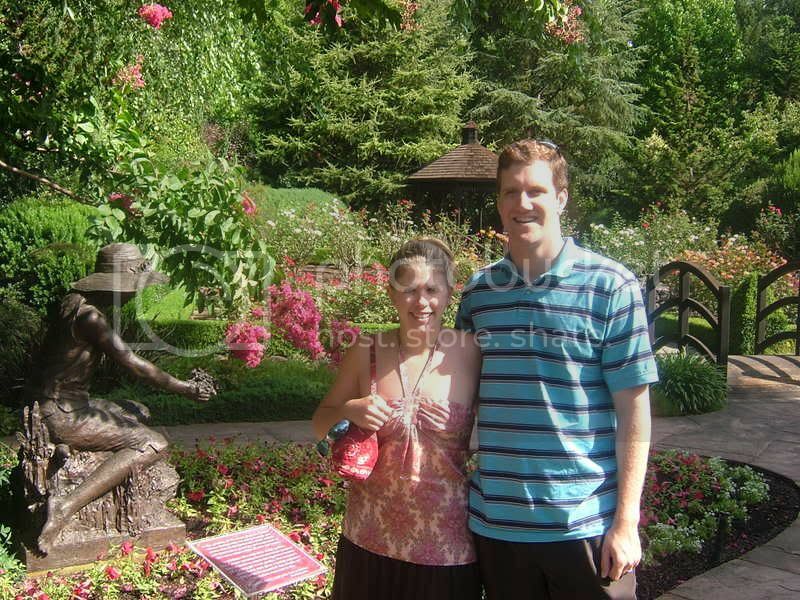 They are impeccably manicured and full of gorgeous flowers. Not to mention the absolutely fabulous new reserve tasting bar. It’s located in the cellar and no expense was spared in building it. The new bar has just opened the week were in Sonoma, so we were lucky to see it. Plus, their tasting was quite varied, the pours were decently sized and the tasting room attendants really knew their stuff. I believe that is the question that many a wine lover (or blogger) has been asking him or herself over the past few weeks. This was the plate of food that was served to everyone at my house. 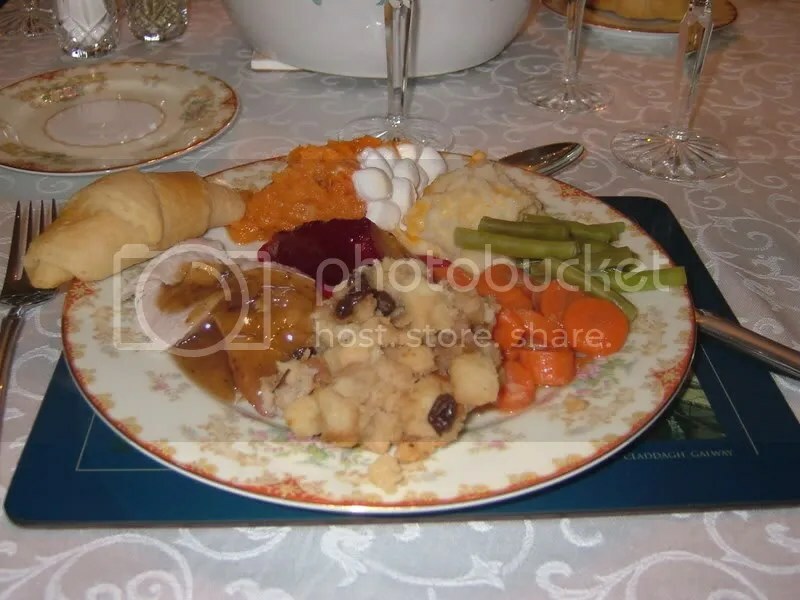 Sweet potatoes with marshmellows, candied carrots, mashed potatoes with cheese, turkey, etc. Is there really a perfect wine to serve with this disharmonious collection of food that somehow all tastes good together? I think the answer I have arrived at is that no, there is no perfect wine to serve. But that’s okay. Since nothing will go fantastically well, why not just serve what you like and add it into the mix of all the other random foods put together on a plate? With that in mind, 4 bottles fell at our house on Thanksgiving. I was little off in my predictions. I thought we would drink 2 white, a red and a dessert. It ended up being 2 white, a dessert and a Champagne. As noted before, we let our guests choose off our pre-prepared list. My husband’s brother and his wife chose the first bottle, a 2005 Ferrari-Carano Sauvignon Blanc. My brother in law said it was because it had Ferrari in the name. Everyone seemed to like it, though I think most were more concerned with tasting all the food at the table than with the wine! It’s a slightly sweet sauvignon blanc with a good bit of citrus rounding out the flavor. I remember really enjoying this the day we tasted it and we do have another bottle hanging around for later. Cork closure, $15. Next we moved on to a dessert wine, which was the choice my husband’s Aunt and Uncle. Being slightly wary of the VA dessert wines on the list, they chose a 2005 Bella Late Harvest Zinfandel. This was also a cork closure and cost $20.50. At 15% residual sugar, I expected this to be a very sweet wine, but it really reminded of a very young port. I thought it had a great finish, a lot of blackberry flavor and I probably should have served it with an assortment of chocolate, but, chocolate would not seem the dessert of choice for Thanksgiving. Up third for the evening was a bottle of Preston Vineyards 2005 Dry Creek Valley Viognier. Cork closure, $22 after a case discount. If you ever have a chance, try Preston’s olive oils. They are superb and I only wish we had taken home a few bottles. This was a good choice for a wine to drink as we did, sitting around playing Trivial Pursuit. It was light and easy to drink, but surprisingly full in the mouth and very smooth going down. It had a bit of spice that I can’t place and maybe a hint of tropical fruit. This was my choice as I realized we were hunkering for a long battle of the wits. Finally, to finish the evening, we opened the bottle of champagne that our Aunt and Uncle were so kind to bring. It was a G.H. Mumm & Cie. Cordon Rouge Brut. I gather it runs around $37 for the bottle and sadly the cork was thrown away before I could see what year it was. I thought this was a very tasty bottle and a great way to finish our evening. I tasted a lot of apple, and thought it was slightly sweet for a brut champagne. A good finish, with just a bit of yeasty undertone. I’d definetly get this bottle again.